soSIMPLE Software announced fmGateway for Zapier, a free Zapier app, during the 2017 FileMaker Developers Conference. Currently, fmGateway is in “Beta” status. 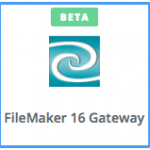 In order to get out of Beta status, Zapier requires that we reach a threshold of Active accounts – these are not just connections that you’ve made to your FileMaker 16 Server, but actually live connections that are scheduled and running. Once we’ve reached this threshold, fmGateway will be added as a publicly available app in their directory for anyone to use. Make sure you can reach FileMaker Server’s web components from the public internet (if you can reach a WebDirect app, you should be all set). Fill out the form below. You will immediately be sent an invitation to join the beta. Log onto Zapier, add fmGateway to your Zap, and follow the instructions to connect to your FileMaker app. Make sure your Zap stays live! This is how fmGateway will become a global app. Fill out this form to get immediate access to fmGateway. And please let us know how you’re using fmGateway. We’d love to hear from you.